Long before "slow food" became a catch phrase, I was an advocate of leisurely cooking. I adore Sunday dinner, bread that rises three times and epic lasagnas. But I'm also a realist. Some days, 30 minutes is all you've got. 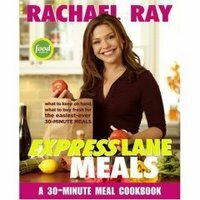 On those days, Rachael Ray really is your buddy. Rachael Ray really is my buddy everyday! I love to cook, but not for hours on end - there is so much other fun stuff to do, too.